Click on the "Start" button and go to "Control Panel". Click on the "Add or Remove Programs" option. 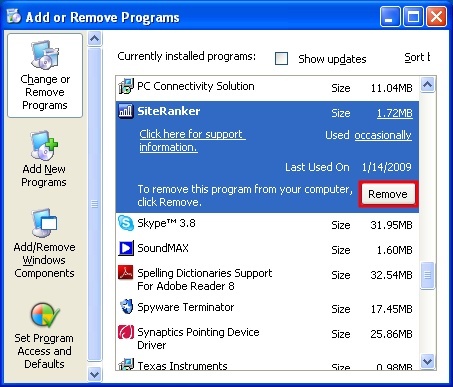 Find SiteRanker in the list and click on the "Remove" button. Click on the "Yes" button to restart you computer. If you do not wish to restart your computer now, click on the "No" button. SiteRanker will be completely removed after you restart your computer.